It’s been a few years since I was last in Moscow, so I was really pleased when the general manager of our network’s Russian media agency asked me to fly over to conduct some workshops for his staff. I had almost forgotten about all the paperwork involved in getting the visa, of course, but was quickly reminded once we set the dates and put the process into motion. Although there was some initial doubt as to whether my visa would be back in time, everything worked out fine and in good time. On the morning of august 10th I was sitting in a German taxi wheeling my way to Düsseldorf airport. The agency must have booked me super-duper-economy, because my seat was almost the last one on the plane. I guess I’m lucky they don’t seat passengers on the wings yet! The flight was fairly empty, though, so I had the entire row to myself. The flight itself was totally uneventful, so I concentrated on tackling the Russian entry forms. When we arrived at Sheremetyevo, I was glad to see that there has been some renovation done since the very first time I landed here in 1975! I can still remember my feeling of discomfort following my initial look up at the ceiling fixtures to see the dust and grime of the ages precariously dangling off them. I remember being afraid to actually touch the grungy banisters on the stairs as I went down the steps one at a time weighed down by baggage as part of the slow-moving queues at passport control. This time the queues were filled with lots of foreign tourists which moved just as quickly (or as slowly) as they would have in Philadelphia or London. If anything, the only leftover from former ‘soviet glory’ was that the people behind the counter acted as though simply smiling would be high treason! There was a girl waiting with my name on a sign on the other side of the barrier, but she was only there to inform me that – due to heavy traffic – the taxi that had been ordered for me would be late. After wading through a crowd of taxi drivers eager for a fare, I got a seat in the waiting area. Why wait for a taxi when there are crowds of drivers waiting for a fare, you ask? Because it’s safer! At best, you may get stiffed by a driver (who may not even be an official taxi driver, but a family man trying to earn a few extra bucks to make ends meet) who takes you to your hotel in central Moscow the long way via Siberia. 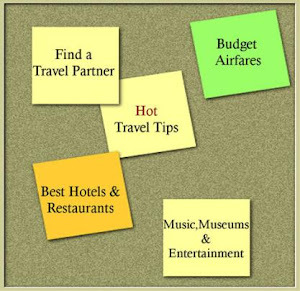 That’s why most Western companies either work with a specific taxi company on a regular basis or simply have one or more drivers on their company’s payroll. Eventually I called Sean, my contact in Russia, to let him know I’d arrived safely. Of course when my driver finally arrived he spoke NO ENGLISH! With sign language he impatiently signalled for me to sit in the back. Although I usually prefer to sit in the front seat of a taxi, I quickly complied and we set off into the city at break-neck speed. Driving in Moscow is certainly not for the faint-hearted. The Russians not only zip from lane to lane with little attention to signalling, they also have no problem sidling right up alongside another car who doesn’t make room for them to change into the lane they need quickly enough! Eventually we reached central Moscow. It is an absolutely stunning, heaving metropolis. Where New York reaches for the sky, Moscow spreads itself along the ground. Where New York moves forward in squares and rectangles, Moscow circles around and around itself. The architecture is mind-boggling, and much of it is fortunately being restored. There are also many of the ‘amenities’ of modern Western life, of course, like new advertising billboards and expensive Western shops. As we turned one corner I caught my first breathtaking glimpse of the Kremlin walls and St. Basil’s cathedral, and I knew that we’d be reaching my hotel soon. When the driver pulled into the parking lot at the hotel Rossija, he looked around at his papers again, then signalled for me to stay seated and ran inside. He then came back and tried to ask me something in Russian. He then signalled for me to follow him into the hotel. Apparently he had lost the paper that told him which hotel I was in! The women at the reception desk proceeded to say that there was no room reserved for me, but my trusty palm pilot knew better, and I was quickly given a key and directed to my room on the 12th floor. 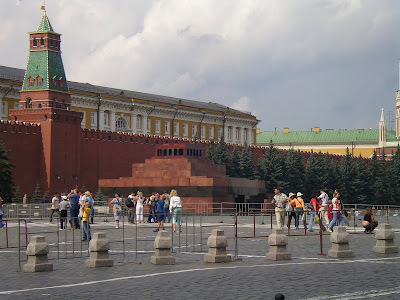 The hotel Rossija is located just across from red square. It is one of the true landmarks of the city and boasts a grand total of 2700 rooms. And let’s just say that it – and its staff – have lost none of their peculiar ‘Soviet charm’. The hotel apparently hasn’t been updated or renovated since Brezhnev was in office. Although I didn’t stay here in the 70’s, I do remember many of the same ‘institutions’ from the hotel I did stay in, which was right across the Moskva river – like the ‘floor person’ who is in charge of all things large and small on ‘her’ floor. For those of who’ve been to Europe before, just imagine a French concierge who’s served 15 yrs. in the Soviet army and 5 yrs. in the KGB, and that’ll be about right. There is always some dire-looking guy to check your I.D. before you head for the elevator. Even at the agency office they have some guy hanging out in the reception area to ‘filter’ unwelcome visitors. Let’s just say that all the women visiting a hotel aren’t exactly ‘ladies’, and all the ‘businessmen’ visiting your company aren’t necessarily “businessmen”. When I unlocked my room I realized it made a double at your local motel 6 look like a complete suite in the Plaza Athenèe on the Riviera. 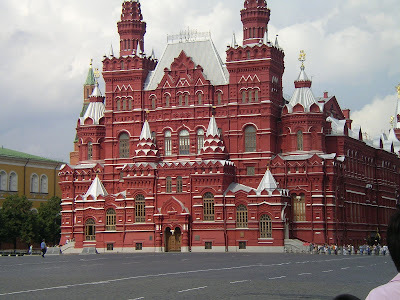 Last time I was in Moscow I was travelling for a client, and was booked into a suite at the très ritzy ‘Baltshug Kempinski’ right across the bridge at over $400/night. However my present room was quite clean, the water pressure was good, and the bed had fresh sheets on it. There was also a café of sorts at the end of the floor, so having a snack or light meal would still not be a problem. 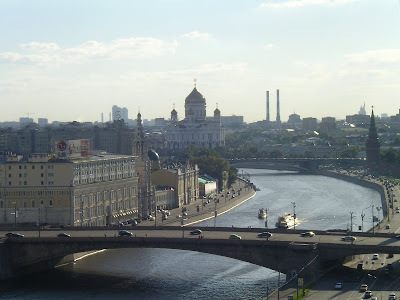 And from the huge picture windows I had an absolutely stunning view of the Moskva river, one corner of the Kremlin. A couple hours after I arrived, the general director from our media agency arrived to take me to dinner. Gavin took me to a Georgian restaurant not too far from the center of the city: “at Pirosmani’s”. It was really quite quaint and cosy, and I was happy to hear that people like Bill Clinton and Gerhard Schroeder had already wandered in to test the food for me. Gavin and I had a big plate of fresh parsley, purple sage, tomatoes, cucumbers, scallions and radishes along with our entrees and some assorted Georgian cheeses. We had Georgian bottled water (heavy on the sulfer) and a cool Russian ‘baltika’ beer to wash it all down. Although I found the normal Russian-on-the-street about as aloof and brusque as most people consider New Yorkers to be, the colleagues I met at both offices were anything but! They were eager to work with me, had lots of questions, and were genuinely friendly and helpful. The first two workshops were held in a beautiful outdoor location – a kind of café-restaurant in the middle of a huge park near the center of the city. There are concerts held in the park in the summer, and part of the park is flooded for ice skating in the winter. The food was good, too, though I didn’t know what all of it was and some of it was unusual. For example, one day we had a kind of Russian soup specialty that was served with a small bowl of sour cream on the side. But at least there was no ‘mystery meat’ included in the recipe. Even as far back in the mid-90’s I can remember coming to Moscow and being served something that didn’t look quite like it could have been made from any animal naturally created by God! Because we were having 3-course lunches during the workshops, I limited my dinner the first few nights to a small bag of chips and beer from the little café on this floor. Finally I got adventurous, though, and decided to grab a book and actually have a sit-down meal there. The whole place looks like it was preserved from the early 1970’s, right down to the dull plastic plants, dusty upholstery on the chairs and vinyl tablecloths. The young ladies working there were an anomaly for the hotel. Both ladies were modest and friendly, and surprisingly unafraid to smile. Although on the same floor as my room, even the view from the cafe was astonishingly retro. With very few and exceptions, the huge picture windows afforded a view over the rooftops of Moscow virtually without advertising. If it hadn’t been for the obvious warmth of the waitresses, I could have sworn I’d been sucked back into a pre-glasnost time warp! Sunday was my only day off on this trip, so after catching up on my sleep I got dressed and headed off to Red Square. I was again overwhelmed at just how much had changed – not only since 1975, but even since the late 90’s! Again I felt the same sense of wonder and awe as I looked at the exotic, brightly colored façade of St. Basil’s, and my personal favourite, the seemingly snow-capped edifice right behind it. Although I stopped to take a few quick photos, I knew exactly where I was headed: ‘GUM’! ‘Gum’ (pronounced: ‘goom’) is the old Soviet shopping complex. I first went there in 1975 and wandered around both perplexed and fascinated. There were stalls full of deep-piled fur hats and ankle-length fur coats. Anyone who’s ever braved a Russian winter knows exactly why these are so popular, and the main reason isn’t fashion! Of course there were also the endless rows of ‘matruschkas’, along with enamelled boxes and pins. Other shops had caviar and sparkling wine and Russian vodka. My most tangible memory of ‘gum’ from 1975? Wandering through the main aisle from ice cream stand to ice cream stand. It was an unseasonably warm April, so ice cream was just what the doctor ordered! But coming from the land of Baskin-Robbins, how was I to fathom a country where you could only buy one flavor of ice cream? Needless to say, my latest excursion was a totally different affair! ‘Gum’ is now a honeycomb of fashionable and very expensive) Western shops bursting with almost everything capitalism has to offer. Oh, the stackable ‘matrushka’ dolls are still there, as are the enamelled boxes as well as other handcrafted articles by entrepreneurial ‘new’ Russians. There were even the infamous cow sculptures painted brightly by local artists and posed all through the mall to look at and pose beside. In the end, I sat at a table in a little alcove overlooking a fountain in a central and wrote some postcards while I mused about what all has happened, both in my own life as well as in the life of this historic city, since I was first here.